Pope Francis has ordered that cards be printed and distributed depicting victims of the nuclear bombing of Nagasaki. 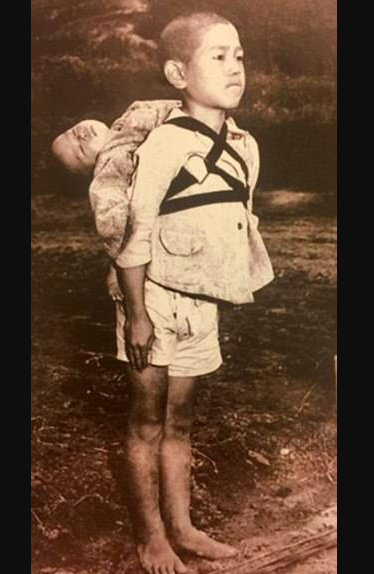 The Pope said that the harrowing image which shows a boy carrying his dead brother on his shoulders while waiting in line at a crematorium should be captioned "the fruit of war", accompanied by his signature. The heartbreaking photo was captured by US Marine photographer Joe O'Donnell after the nuclear bombs were dropped in Nagasaki at the end of World War II. A caption adds: "The young boy's sadness is expressed only in his gesture of biting his lips which are oozing blood." After the bombing of Hiroshima and Nagasaki in 1945, Japan's subsequent surrender ended World War II. Photographer O'Donnell then spent a further four years recording the aftermath of the bombings in the two cities, according to Library of Congress records. Pope Francis has previously condemned the nuclear weapons and highlighted the plight of children in war zones. The harrowing image of nagasaki victims from the Pope comes amid heated tensions between the U.S. and North Korea. In November, the Pontiff told an anti-nuclear weapon conference that the possession of nuclear weapons was now "irrational". "Today, is it legitimate to keep nuclear arsenals as they are? Or to save creation, to save humanity today, isn't it necessary to go back?" Pope Francis added. The Vatican City was also said to be desperately attempting to open a dialogue between Pyongyang (North Korea) and the Holy See, the Express reported last month.